The Hurford Humanities Center-sponsored symposium explores various expressions of African-American thought pre-and post-Civil War. The John B. Hurford '60 Humanities Center at Haverford College will present a symposium entitled“From Slavery to Freedom: The Formation of African-American and American Identity” on Saturday, October 27. This program, which is free and open to the public, will take place from 9:30 a.m.-5 p.m. in Room 102, Stokes Hall. The symposium will address the history, culture, and military and literary expression of African-American feeling and thought in pre- and post-Civil War America. It was organized by Professor William Earle Williams of Haverford's Fine Arts Department in conjunction with three exhibitions at the College: at the Cantor Fitzgerald Gallery, Unsung Heroes: African American Soldiers in the Civil War (photography by Williams) and Emancipation and Denigration: Thomas Nast and His Colleagues Picture Black America, curated by Jay G. Williams, Professor of Religious Studies at Hamilton College (a collection of wood engravings by the famed 19th-century illustrator and his contemporaries); and in the gallery of Haverford's Hurford Humanities Center (located in Stokes Hall Room 102) and Multicultural Center (Stokes Room 106), A Journey Towards Hope: Underground Railroad Sites in Oberlin, Ohio (photography by Coriana Close of Oberlin). The symposium speakers and schedule are: 9:30 a.m. Gustavus Stadler, Associate Professor of English, Haverford College:“Hearing Loss: The Sound of Racial Melancholia around 1900,” an investigation of aural representations of African Americans, African-American history, and lynching in the United States at the turn-of-the-century. 10:05 a.m. Tracey Hucks, Associate Professor of Religion, Haverford College:“Theorizing Religious Tabby: African American Religious Beliefs 1619-1865,” an examination of the development of black religious institutions in early America and the impact of slavery on black religiosity. 10:45 a.m. Richard Reid, Professor of History, University of Guelph, Canada:“A Different Civil War: African American Experiences during the Civil War.” 11:20 a.m. Jay G.Williams, Professor of Religious Studies, Hamilton College:“The Portrayal of the African American Political Condition in the Cartoons of Thomas Nast,” who was one of the major political commentators of the post-Civil War era. This talk will explore the nature of Nast's art and his role in the nation's struggle to overcome racial prejudice and oppression. Lunch Note: please email Kerry Nelson (knelson@haverford.edu) if you wish to have a complimentary lunch. Deadline: Monday, October 22 2:15 p.m. Thomas Lloyd, Associate Professor of Music at Haverford and Director of the Haverford-Bryn Mawr Choir:“The Origins of the African American Spiritual.” 2:50 p.m. Coriana Close, Photographic Artist (A Journey Towards Hope: Underground Railroad Sites in Oberlin, Ohio), Cleveland, Ohio:“Uncovering Oberlin's Abolitionist History.” 3:25 p.m. William Earle Williams, Professor of Fine Arts and Curator of Photography, Haverford College:“Unsung Heroes: And the American Vernacular Landscape,” an exploration of how art has the potential to reunite places with their histories and thereby return them to our collective memory. The exhibits will remain on view through Sunday, October 28. Unsung Heroes features 61 black-and-white photographs of battle sites in both the North and South. The exhibit catalog was published by Light Work (organizers of the show) and reproduces 40 images in duotone from the contact sheet series. Emancipation and Denigration spotlights the sharp political commentary and biting wit of the man called“The Father of the American Caricature.” Both shows are on exhibit in the Cantor Fitzgerald Gallery, Monday-Friday 11 a.m.-5 p.m., Saturday and Sunday from noon-5 p.m., and Wednesdays until 8 p.m. 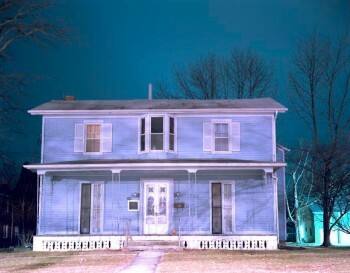 The images in A Journey Towards Hope include large-format color photographsâ€”many taken at night with long exposure timesâ€”of buildings in Oberlin that were essential to the abolitionist movement. Coriana Close graduated from Oberlin College's fine arts program with honors in 2006. The Humanities Center Gallery and the Multicultural Center are open Monday, Wednesday, and Friday 3-5 p.m., Tuesday and Thursday 4-5 p.m., and Saturday and Sunday 1-5 p.m. For more information, contact Emily Carey Cronin, Associate Director of the Hurford Humanities Center, at (610) 896-1336 or ecronin@haverford.edu.